This is an extension I requested over half a year ago. Letmethink figured out how to use the pitch property and sent me a zip. I've updated it. It works pretty well -- I'm using it to enhance a slow motion effect. But you could use it for more! Here's the blocks, they're pretty easy to use. 1 is normal, .9 .8 .7 .6 .5 etc bring the pitch down and 1.1 1.2 1.3 etc bring it up. **Note** You can only change the pitch of sounds that are currently playing. To change the pitch of a new sound, you must play the new sound and then change the pitch using the channel block. Looks like pitch is only available in legacy openfl. No matter if OpenFL Legacy is selected or not. This extension causes the compilation errors, anyway. What platform are you testing on? Some of them use next by default (html5 and flash, IIRC). I would like to use this extension in Flash and HTML5 games. Looks like there's no planned support at all for pitch on Flash and HTML5, so it'll likely be a lot more work for the extension author to support those two. That demo is sick though Liberado. Iirc when I made this I did a bit of research and say a way to do it in flash (via native flash code), but never looked into it too deeply because Max was using it for iOS. Does this still work for iOS? The download isn't there anymore. 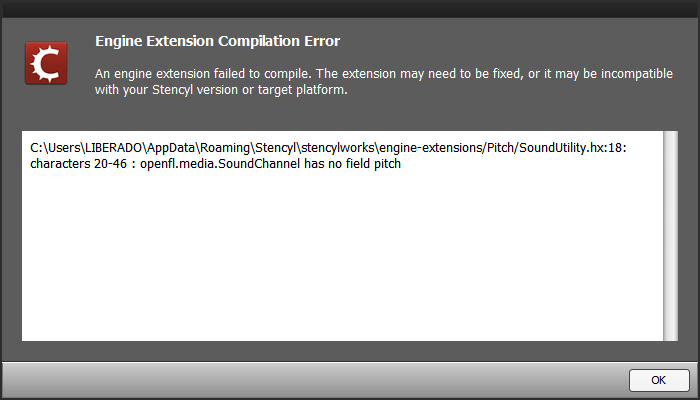 Sadly, this extension does not work on Stencyl v3.5, maybe because pitch is only available in OpenFL Legacy, as Justin said.